In the box score, it will show Kyle Lohse for only four earned runs, but he is as much to blame as Brendan Ryan’s fifth error in three games which led to a 9-6 loss to Houston Wednesday night. Ryan booted a ball, as you’ll hear in the postgame comments below that had kind of a knuckleball feel to hit as it was hit to him. After that error, Lohse was unable to stop the bleeding as he gave up a bases loaded double to Jeff Keppinger and then a two run homer to Lance Berkman, all with two outs. 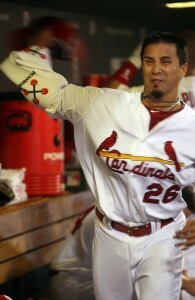 In all, Lohse gave up all nine runs in five innings on 10 hits as Lohse never made it out of the sixth. In my afternoon report, I stated that I really thought the Cardinals had a solid shot at Wandy Rodriquez, they always seem to hit him well, yet they struggled to get much going against him until the bottom of the sixth. Doubles by Albert Pujols and David Freese along with an RBI single from Nick Stavinoha helped lead to a four run inning making the score 9-5. The Cardinals had the tying run at the plate in the ninth after Albert Pujols doubled for the second time of the game to make the score 9-6, but Matt Holliday lined out with runners on second and third.